The City Building Department and Legal allowed the owner to complete and occupy the building as per his intentions. We believe the building is now fully leased. SAHRA proceeded with a By-law Amendment submission to City Council to provide better wording to enforce the Avenue Road Avenue Study guideline/by-law that step-backs are required on the wall facing a side street. We were able to get this by-law amendment in place on March 10, 2016. Local residents, SAHRA and OOGRA (Old Orchard Grove Residents’ Association) have been following this ‘renovation’ development for a number of months as it was not compliant with By-laws set up as a result of the Avenue Road Study in 2009. Because this is a renovation rather than a knock down and new build, it is managed by the Building Department rather than Planning. As the developer has not built according to the Permit(s), a Stop Work Order was issued in Nov, 2014 for seven non-compliant items. The developer then applied to the Committee of Adjustment for a variance to NOT have to do a step-back on the 3rd floor abutting Joicey. SAHRA, OOGRA and a large number of residents submitted Letters of Objection to the CoA hearing scheduled for May 7, 2015. On the day of the hearing, the developer withdrew the application! The developer told the Building Department that it was his intention to challenge the issue through the courts rather than through the CofA. The Building Department has stated that their position remains that the construction above the third floor is not permitted without the proper step-backs from both Joicey Street and Avenue Road, including the step-backs on the third floor. The Building Department has revoked the permit for construction above the third floor. But construction continues! Not just on the second floor (which is allowed) but on the third, fourth and fifth. Not dismantling to become compliant, but work to complete the building in its non-compliant state. We have been told that the issue is now in the hands of the City Legal Department. SAHRA is continuing to communicate with Councillor Carmichael Greb and the Building Department repeating our request that the Avenue Road Study guidelines and the associated By-laws be enforced. This is precedent setting for the future development of Avenue Road! No updates have been received from the Building Department since our last update on July 19th advising that the matter is now in the hands of the City’s Legal department. The developer is allowed under Permit to carry on with work on the second and third floors. But the Permits for the fourth and fifth floor have been revoked…although work continues on these floors. In our last update on June 3rd, we advised that the developer withdrew his Committee of Adjustment (CofA) application on May 7th. We questioned the Building Department whether he would be resubmitting to the CofA and were told that the developer has told the Building Department that it was his intention to challenge the issue through the courts rather than through the Committee of Adjustment. The Building Department has stated that their position remains that the construction above the third floor is not permitted without the proper setbacks from both Joicey Street and Avenue Road, including the setbacks on the third floor. 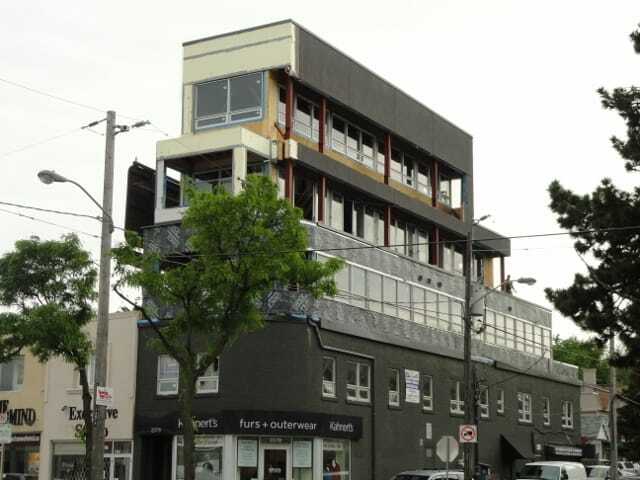 The Building Department has revoked the permit for the construction above the third floor. But construction continues! Not just on the second floor (which he is allowed to do) but on the third, fourth and fifth. Not dismantling to become compliant…but work to complete the building in its non-compliant state. We continue to send pictures of the on-going activity but the Building Department appears unable to enforce the stop work order and the revoking of permits. We have been told that the issue is in the hands of the City Legal Department and that there should be an answer later this coming week. SAHRA is continuing to communicate with Councillor Carmichael Greb and the Building Department repeating our request that the Avenue Road Study guidelines be enforced, including all setbacks both off Avenue and Joicey and at the rear of the building. This is precedent setting for the future development of Avenue Road! We will give you an update again as soon as we are advised on results of the meeting this week as we know that many of our members/residents are very concerned about this non-compliant development. In our email on May 11th, we informed you of the results of the May 7th Committee of Adjustment hearing for this property…the developer withdrew the Application!We asked the Councillor and the Building Department to review the situation to determine what this meant/what the developer’s intentions were/where we go from here.We talked with Will Johnston, Director, Building Department on May 27th. He confirmed that the Building Department is “standing strong on the need to comply” – that they want compliance. We understand that Building has revoked the Permit and that they are discussing the issue with Legal.Meanwhile dismantling work continues, perhaps to correct non-compliant issues?We have explained to the Building Department that SAHRA is very concerned about what this developer is doing. It is precedent-setting for other developments on Avenue Road. We will continue to ask the Building Department to report on status/compliancy. 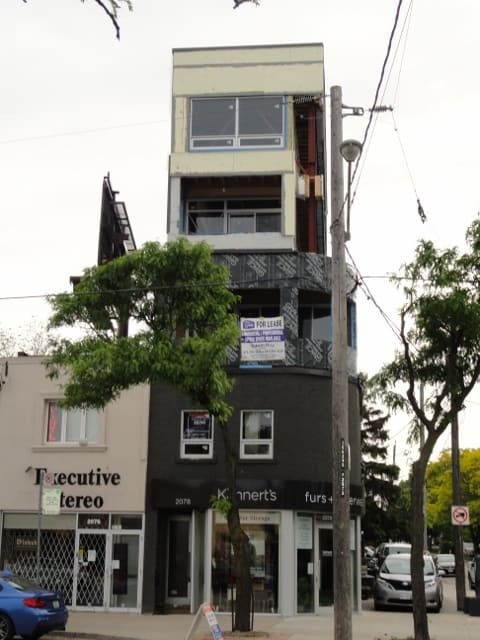 Our email blast of May 1 outlined SAHRA’s objection for requested variances submitted to the Committee of Adjustment (CofA) on May 7th by the developer of 2078 Avenue Road so that he would NOT have to do a step-back on the 3rd floor abutting Joicey. SAHRA submitted a letter of objection along with a 10-page outline detailing the guidelines/recommendations from the Avenue Road Study (2009) along with a history of the building at this site. CORRA (Confederation of Residents and Ratepayers Association) submitted a supporting letter of objection as the development does not maintain the intent of the City’s Official Plan and the Avenue Road Study. Councillor Carmichel Greb submitted a letter asking that the Committee Refuse this application due to its inconsistency with the Avenue Road Study guidelines and because it does not meet the four prescribed tests: the variances are not minor, not appropriate to the land and buildings in the area, do not maintain the general intent of Zoning Code and By-laws, and do not maintain the general intent of the Official Plan. In addition, 36 letters of objections, many with personal comments/perspectives were submitted by concerned residents. A number of these residents were very involved with the Avenue Road Study between 2007 to 2009, providing valuable insight on the intentions of the Study. A Staff Report was prepared by Planning for the CofA. It was disappointing in that they did not address the Avenue Road guidelines regarding the step-back at the 3rd floor abutting Joicey. Rather they recommended that (1) the proposal be developed substantially in accordance with the north elevation submitted to the CofA on Feb 25, 2015 which only shows the step-back at the 3rd floor abutting Avenue (and not at the 5th floor – apparently the Building Dept says that the 45 degree angular plane is maintained as it is), (2) that a cornice or architectural feature be provided at the top of the 2nd-storey facing Joicey to reinforce the 2-storey character of the area and (3) that commercial boulevard parking on Joicey be removed when the current permit expires and be replaced with landscaping. A SAHRA representative and other interested residents attended the CofA hearing which was scheduled as the last application to be heard at the May 7 session starting at 3:30 p.m. The session ended without this case being called! The attendees were then advised that the applicant had not appeared as he had ‘withdrawn the application’. We have never encountered this situation before. We are waiting for the Councillor’s office to review the situation with the Committee of Adjustment and the Planning and Building Departments to determine what this means/what the developer’s intentions are/where we go from here. Does this perhaps means that the developer intends to alter the third floor abutting Joicey to provide the 2m step-back? We are very concerned about what is going to be done to make 2078 Avenue Road compliant with the Avenue Road Study guidelines. We will monitor the situation closely with Councillor Carmichael Greb and the Planning and Building Departments and advise you as soon as we obtain information on what is going to happen now. It’s a busy week on Avenue Road…on May 4 there is the Community Consultation Meeting for 2088 Avenue Road and on May 7 there is a Committee of Adjustment hearing for variances at 2078 Avenue Road. In both these situations, the Avenue Road Study guidelines/recommendations are not being followed. We are asking our residents to submit letters of Objections to both applications. We sent out an email blast on Friday (May 1) with a template of a letter to send about 2078 Avenue Road to the Committee of Adjustment . The Committee needs to understand that the residents in this area want the Avenue Road Study recommendations to be honoured for the developments on Avenue Road between Lawrence and Wilson.